Fans of the 1980 movie Caddyshack may get Caddyshack-themed alcohol in the near future, if a recent trademark application is any indication. On December 21, Warner Bros. Entertainment Inc. filed an application with the U.S. Patent and Trademark Office to register CADDYSHACK as a trademark for "alcoholic beverages except beer" in Class 33. Warner Bros. filed the trademark application on an intent-to-use basis, suggesting it is not currently using CADDYSHACK as a trademark for alcoholic beverages except beer yet, but has a bona fide intention to do so in the near future. TMEP 806.01(b); 15 USC 1051(b). Warner Bros. will need to start using CADDYSHACK as a trademark for those beverages before this mark can register. TMEP 902. In other words, this application does not guarantee that Warner Bros. will release a Caddyshack alcohol, but it does (or is supposed to) mean something concrete is in the works. According to my quick search, Warner Bros. owns five other trademark registrations for CADDYSHACK covering a variety of merchandise, but this is the first one for alcohol. Those looking for Caddyshack alcohol should keep their eyes peeled (although fans wanting a Caddyshack beer might be out of luck). Labels: alcohol, caddyshack, trademarks, warner bros.
On December 9, 2018, with 7 seconds left in the fourth quarter, the Miami Dolphins took the ball 69 yards, lateraling it twice, to beat the New England Patriots 34-33. You can see a video of the play here. To Patriots fans, it was a nightmare. To Dolphins fans, it became the "Miami Miracle." And now the Miami Dolphins appear to be capitalizing on that phrase with a federal trademark application for MIAMIRACLE. Entertainment services in the form of professional football games and exhibitions (Class 41). The Dolphins filed this application on an intent-to-use basis, meaning the NFL team will need to actually start using MIAMIRACLE as a trademark in conjunction will all the goods and services listed in the application before the term can be registered as a trademark. TMEP 806.01(b); 15 USC 1051(b). This isn't the first NFL team to file a federal trademark application for a "miracle." Last year, the Minnesota Vikings filed trademark applications for MINNESOTA MIRACLE and MINNEAPOLIS MIRACLE after their win against the Saints in last year's NFL playoffs. Most of those applications, which I blogged about here, are close to registration. Think Barbour jackets have a distinctive look? Barbour does, and the clothing company is seeking to protect that look through a federal trademark registration. 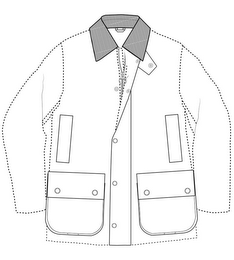 On December 13, J. Barbour & Sons Ltd. filed a federal trademark application with the U.S. Patent and Trademark Office for the jacket configuration seen below. The mark consists of a three-dimensional configuration of an outerwear design featuring a combination of the following elements: (a) four pockets placed and oriented as follows: two on each of the front left and right side beginning at the mid-breast of the jacket and extending to the waist of the jacket; two large pockets on each of the left and ride side of the jacket beginning at the waste [ed. - sic] and extending to just above the bottom of the jacket both with exterior flap closures and two eyelets on the underside of the front pockets; (b) a metal zipper pull configured in a ring shape with the top quarter of the ring being solid on a two-way opening zip; (c) a collar made of corduroy with detachable throat cover; and (d) a studded flap that closes over the entirety of the front zipper on the middle of the jacket. The application covers "Clothing and outwear, namely, coats and jackets" in Class 25 (not surprisingly). According to the application, Barbour has been using this design as a trademark since 1980. As I've blogged about before, a product design trademark (often referred to as "trade dress") can be registered as a trademark if it is (1) non-functional and (2) inherently distinctive or has acquired distinctiveness in the marketplace. TMEP 1202.02; TrafFix Devices, Inc. v. Mktg.Displays, Inc., 532 U.S. 23, 28-29 (2001). Generally, to show this coat design is non-functional, Barbour will need to demonstrate that the features it seeks to register are not essential to the use or purpose of the article and do not affects the cost or quality of the article. TMEP 1202.02(a); Qualitex Co. v. Jacobson Prods. Co., 514 U.S. 159, 165 (1995). For example, Alexander Wang (which I previously blogged about) is having difficulty showing that its configuration for several zippers on a handbag isn't functional, in part because (1) Alexander Wang's advertising stated that the separate zipper compartments are for "multi functionality" and (2) several other designs from third parties incorporated zippers in the same areas, indicating there is not a wide variety of alternative designs available to competitors. If Barbour can demonstrate that its jacket trade dress is not functional, it must show that the design has acquired distinctiveness in the marketplace, because product designs are never inherently distinctive. Wal-Mart Stores, Inc. v Samara Bros., 529 U.S. 205, 215 (2000). Generally, that means Barbour will need to submit convincing evidence demonstrating to the USPTO that when consumers see the jacket design Barbour seeks to register, they recognize it as a Barbour jacket (not just any jacket). So, is Barbour's pocket placement, zipper design, and zipper flap essential to the use or purpose of the jacket? Are there other alternative jacket designs available to competitors? Or would designing around this configuration be too costly? Do you recognize this configuration as a Barbour jacket? Like Alexander Wang, Barbour may have a difficult time convincing the USPTO that this trade dress is registerable. We'll see what the USPTO thinks in approximately three to four months when this application is reviewed by an examining attorney. LVE Development, LLC, a business entity presumably associated with Dallas Cowboys rookie Leighton Vander Esch, had a busy day at the U.S. Patent and Trademark Office on December 3rd. On that day, Vander Esch's entity filed 30 trademark applications ($6,750 in filing fees, if anyone is counting). Many of the filings appear to be related to Vander Esch's new online store, which he announced on Twitter two days after the filings. How can 30 applications cover only five different trademarks? Because LVE Development filed each application in a single class of goods/services. For example, LVE Development filed one application for THE WOLF HUNTER in Class 28 for footballs and another application for THE WOLF HUNTER in Class 36 for a variety of charitable services. It's possible to list multiple classes in a single application, but an issue in one class can hold up the entire application, so it's often best to break up a multi-class filing into separate applications (the filing fees remain the same either way). Backpacks; Athletic bags; Duffel bags; Gym bags; Sports bags; Weekend bags (Class 18). And how do we know these trademark applications are actually associated with Leighton Vander Esch? Because Vander Esch gave his written consent to file each application and such consent was submitted to the USPTO. That written consent is required under Section 2(c) of the Trademark Act, which prohibits the registration of a mark consisting of the name of any living individual without that individual's written consent. That applies to pseudonyms, stage names, and nicknames as well (i.e. THE WOLF HUNTER). See TMEP 1206.01. According to my quick search, these are the first and only federal trademark applications filed by LVE Development, LLC.